A native of Alexandria, she received her medical degree from LSU Medical Center in New Orleans. After completing her internship at Alton Ochsner Medical Center in New Orleans, Dr. Laird Russo completed her ophthalmology residency at the prestigious Bascom Palmer Eye Institute at the University of Miami. She went on to complete a Cornea, External Disease and Refractive Fellowship at Tufts University in Boston. Dr. Laird Russo was elected to the AOA Honor Medical Society and is the recipient of the Janet M. Glasgow Achievement Award. 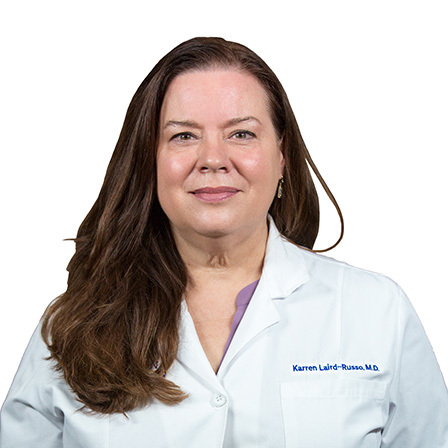 Dr. Karren Laird Russo specializes in diseases and surgery of the eye including No-stitch cataract surgery, LASIK (iLASIK, Intralase) surgery, corneal disease, retinal laser and cosmetic oculoplastic surgery.